Bitly, the popular link shortener used by the BBC, Independent, Daily Telegraph and many other news websites, has today announced its ‘bitmark’ service. Anyone who uses social bookmarking sites like Delicious or Pinterest will be familiar with the idea of saving and sharing articles they find interesting. 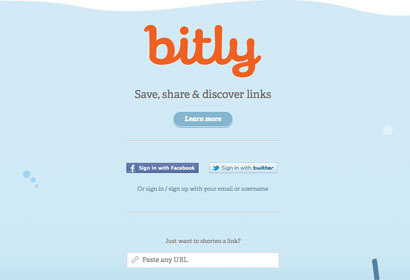 Bitly has added this functionality to its already popular link shortening service. So, what are bitmarks? It’s a better name for bookmarks. Bitmarks are the interesting links you collect across the web — a hard to find recipe, an article, an awesomely hysterical video. It’s anything that you find and want to save and maybe even want to easily share. You can organise them into bundles based on a theme or share them with your friends via Facebook, Twitter, and email. You decide whether each bitmark gets published to your public profile or saved privately, so that only you can see it. Since Bitly started in 2008 more than 25 billion links have been shortened on the site, according to the company. More than 80 million links are shortened on Bitly every day and they are clicked on 300 million times. Its easy-to-use analytics makes it popular with publishers that want to track their social media reach. Until now it has been used a tool rather than a destination page, but the company hopes the new focus on social bookmarking will foster a community around the site. This entry was posted in Social media and blogging and tagged bitly, Bookmarking, journalism tool, link shortening, social bookmarking, social media on May 29, 2012 by Daniel Bentley. I have been using Bitmarks recently and have had a good experience. I think another reason why it will be successful is due to the already existing user base of Bitly. After all it is the most popular link shortening service. Its a Great news ,I would like try to use it,I have used prior bitly,I also fan of bitly Social site. I have created many Bitmarks using Bitly social site ,I love the bitly services ,please to hear about journalism blog of bitly I will use it too. For Architectural Design, Decoration & Construction ___ للتصميم المعماري والديكور والبناء .. Architectural Design, Decoration & Construction ___ للتصميم المعماري والديكور والبناء. Thanks. I am using your website bookmarking services for French website seo. This is an amazing experience for me. Its very easy to work.